Small Eucalypts for landscaping and garden. Gardeners see them as being too big, and many nurseries simply do not stock them. However with so many different species from all over Australia, Eucalypts have many different sized species, and they deserve more recognition in the garden. Landscapers also tend to overlook the smaller Eucalypts, either following the fashions, or through lack of understanding of some of the wonderful smaller growing gum trees that are available. Eucalyptus macrocarpa, ‘Blue Bush’ or ‘Mottlecah’ with its brilliant flowers and foliage is a standout reaching around 3 metres in height. The term ‘Mallee’ is used for a number of these species, this generally means a small Eucalyptus with multiple stems. Mostly from dry areas. Eucalyptus preissiana or Bell-fruited Mallee with its yellow flowers is a classic example. Eucalyptus kruseana or ‘Bookleaf Mallee’ is another. Most of these smaller species have attractive flowers, many have beautiful bark and many can also be pruned to maintain a smaller size if needed. Corymbia ficifolia – With new dwarf varieties that will reach around 3m in height, these wonderful flowering trees are well worth consideration. They also come in dwarf forms that will reach only 3m in height. Read more about Corymbia ficifolia. Eucalyptus caesia – With a weeping habit and reaching around 8m in height a number of cultivars are available. Also known as ‘Gungurru’ Eucalyptus cinerea – Wonderful blue foliage on a tree that takes very well to pruning. So although it can reach 7 – 10m in height it can actually be pruned to very low growing ground cover or hedge. Eucalyptus gillii – One of the ‘Mallees’ reaching around 5m in height with a spreading habit. Eucalyptus kruseana – Another ‘Mallee’, a little straggly in habit, lime green flowers, responds to pruning and flowers in late summer. Variable in height from 3 – 5m. Eucalyptus conferruminata – With the common name of ‘Bald Island Marlock’, this one is from the south of WA, reaches from 4 -8m in height. Eucalyptus leucoxylon’Rosea’ – Variable in height from 10 -25m, however very attractive and with red flowers. A dwarf form named ‘Euky Dwarf’ is even smaller growing to around 6m, a good street tree as well. Eucalyptus macrocarpa – One of the best ‘Mallee’ types, wonderful red flowers on a tree that will reach around 4m in height. Read more about Eucalyptus macrocarpa. Eucalyptus pachyphylla – 5 – 7 m in height with yellow to lime green flowers. 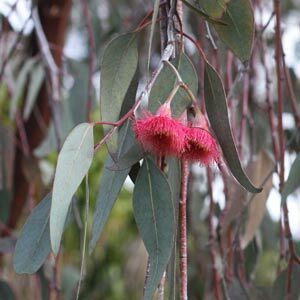 Eucalyptus risdonii – 3 – 6m and being from Tasmania grow well in cooler climates and is not as particular with drainage as some of the Western Australian species. Eucalyptus youngiana – This is the ‘Ooldea mallee’ flowers are most commonly red however pink and green forms are available. Reaches around 11m in height.